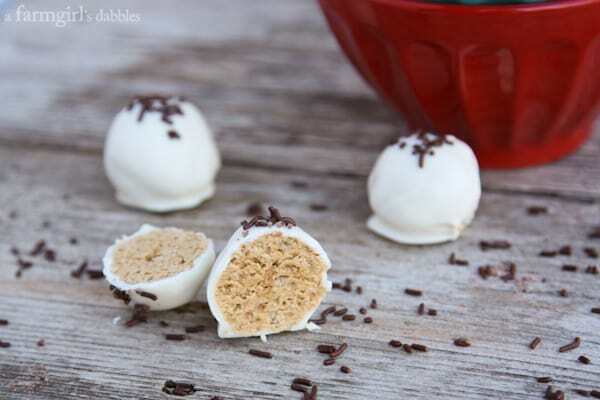 I reached deep into my old recipe box for these Peanut Butter Truffles with Marshmallow and Krispies. When I was a kid, we rolled these small, about the size of a dime. And they were simply referred to as “Peanut Butter Balls”. I pumped the size up just a bit, to more of a standard truffle size, and gave the recipe title additional description. But the flavor is just the same as I always remembered…awesome! I have distinct memories of making these wonderful little treats with my mom and sisters, gathered together in the kitchen on the farm. Each year, our creations looked a little different, depending on the sprinkles available in Mom’s collection found in the upper corner cupboard’s tiered Lazy Susan. Sometimes the balls were plain and unadorned, other times festive with the colors of Christmas. 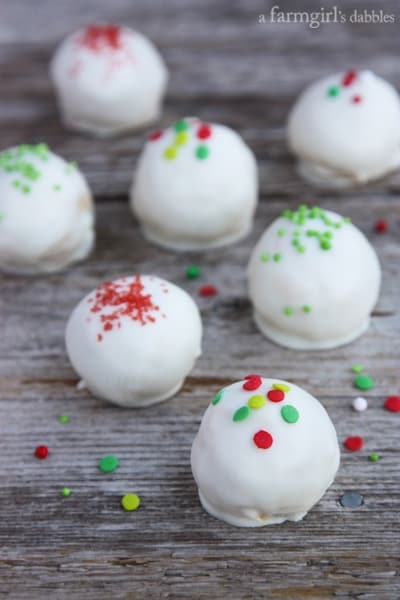 These peanut butter truffles could fit into most any holiday, celebration, or gathering. By altering the sprinkles, with endless choices available, they can be color coordinated for any event. 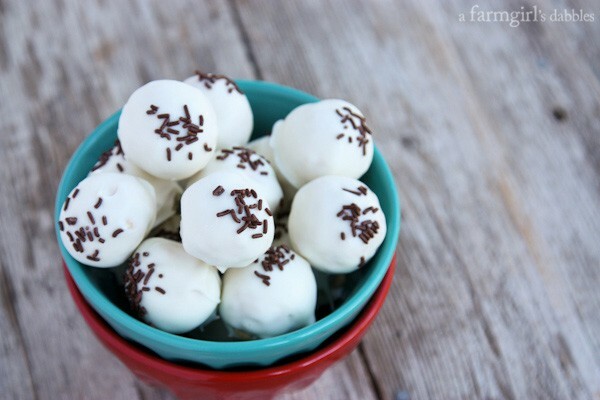 And depending on how the sprinkles are applied, the truffles can go from somewhat elegant to completely playful. Today is St. Nicholas Day, a day that holds many memories full of family tradition and sweet treats. 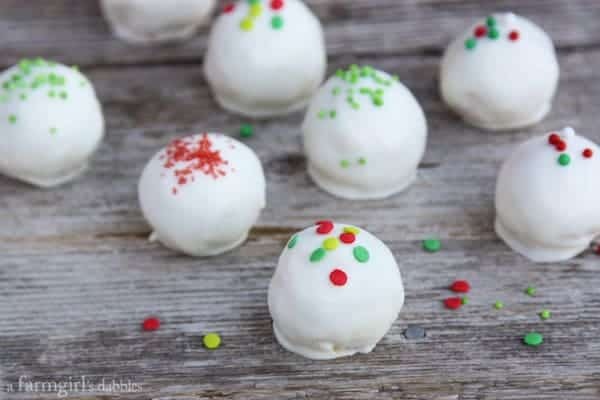 These peanut butter truffles would be an awesome way to celebrate! You can read more about our family tradition here. Do you celebrate St. Nick’s Day, too?! In a medium bowl, stir together peanut butter and marshmallow cream until well combined. Add vanilla and stir well. Fold in Rice Krispies. 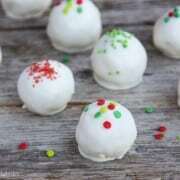 With your hands, roll mixture into 1-1/4″ diameter balls. I used a small cookie scoop to portion the balls. Place balls in a single layer in a 9”x9” pan, and then place in freezer for 3o minutes to chill. Place almond bark in a small to medium sized bowl. Melt in a double boiler on the stove top or on a low setting in the microwave, taking care to not let it get too hot and scorch. When it is almost melted, remove from heat and stir until almond bark is completely melted and smooth. Drop up to three peanut butter balls into the melted almond bark. With two forks, quickly roll one of the balls until completely coated. Lift ball out of the almond bark by setting it on top of one fork, and then tap the fork gently on the side of the bowl, letting excess almond bark drip back into the bowl. Then scrape the bottom of the fork along the side of the bowl, removing the final excess almond bark. Set truffle on wax paper, using the other fork to gently scrape it onto the paper, and repeat with remaining two balls that are in the melted almond bark. Then decorate those three truffles with sprinkles, if desired, before the almond bark sets. Repeat the process until all truffles are created. 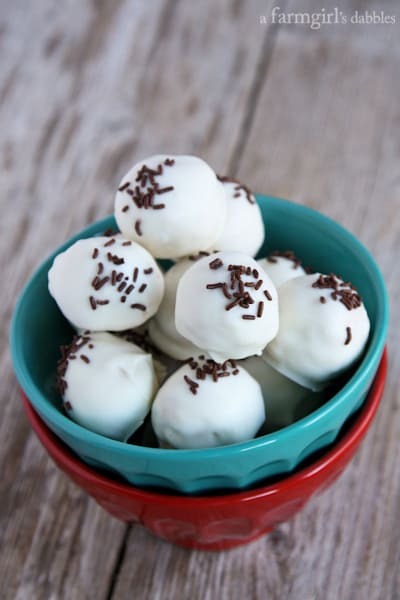 These truffles are excellent for making ahead of time and keep very well in the freezer. Separate any layers with wax paper. Remove from freezer 30 minutes prior to serving. From Mom’s recipe box, originally from a family friend, Dinah Konda.